Do you push yourself sewing wise? 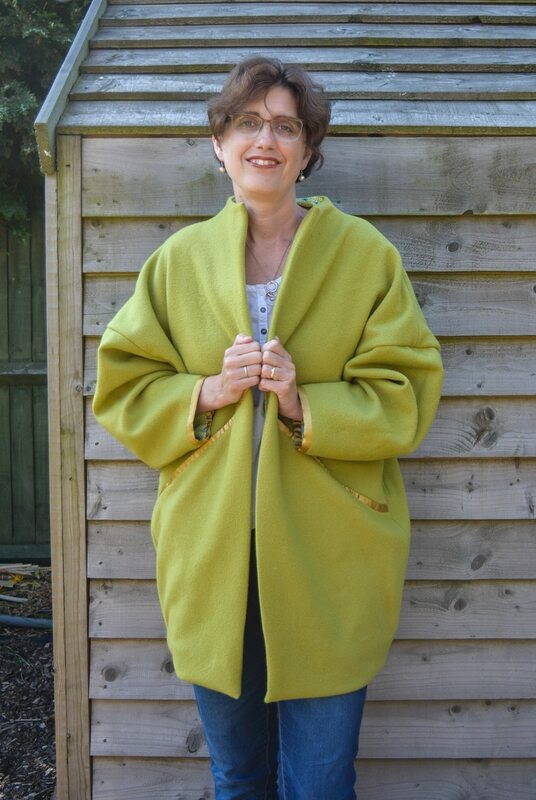 When I saw this beautiful lime blanket in a charity shop at Easter I briefly ummed and ahhed as my thoughts turned to making a coat for the first time. How could I resist such a beautiful colour at merely £10? I felt rather wary about making a coat. 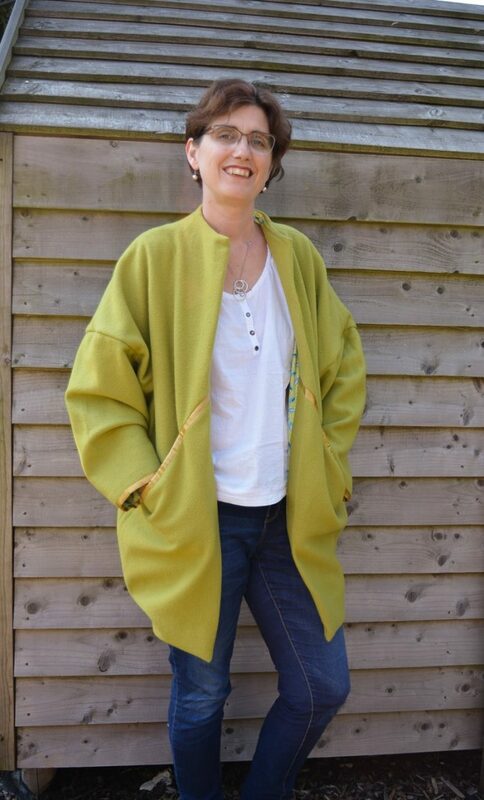 I knew a lime wool coat could be stunning but also knew I would have to learn how to line said coat!! But this creative journey of mine is all about upcycling, plus learning, developing and growing. As I took the blanket to the till the shop assistant told me a lovely tale about how an elderly couple had donated the blanket, a wedding present of theirs, their marriage still going strong 54 years on. Next stop a pattern – Skipton has many charity shops but it also has the most beautiful shop Cool Crafting. I have to admit it is a shop I tend to window shop in, admiring their beautiful fabric and yarn selection, overwhelmed by choice I leave with nothing. They stock a range of patterns from a variety of PDF pattern designers. 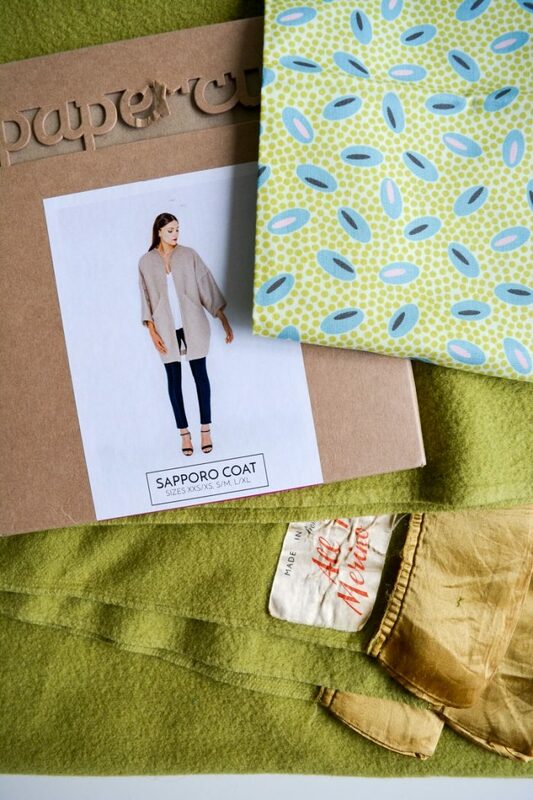 I was served by the most helpful lady, enjoying a proper sewing conversation- following her advice I chose the Sapporo Coat by PaperCut. Then the project stalled, to be honest, I felt intimidated by the project. 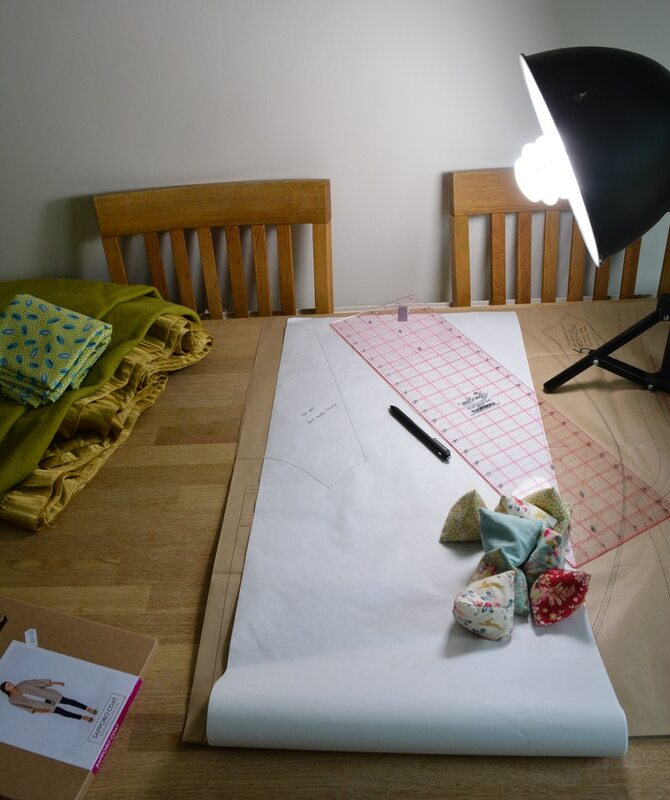 A few weeks later and the project is finished, prompted by my desire to enter the Sewing Portfolios upcycling competition (find out more here). 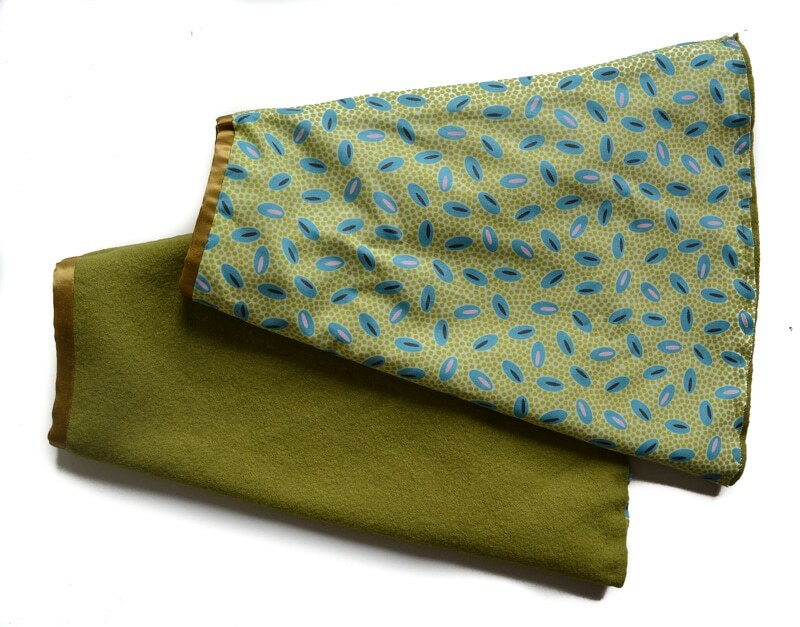 In order to fulfil the brief for the competition, the lining is new fabric “For You – Combo – Apple” from Glenroy Designs ( also very lovely ladies I can enjoy a good sewing chat with). So this is the finished coat, I am so delighted. 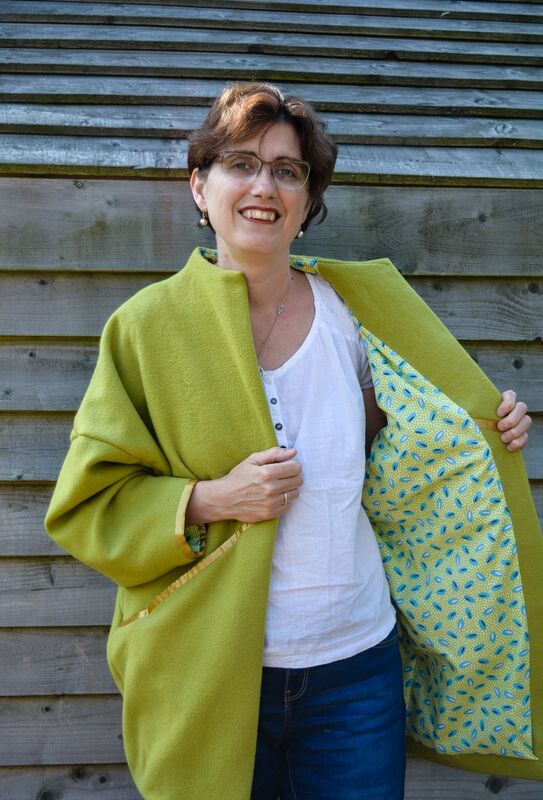 If you are tempted to try your hand at making a coat go for it!! 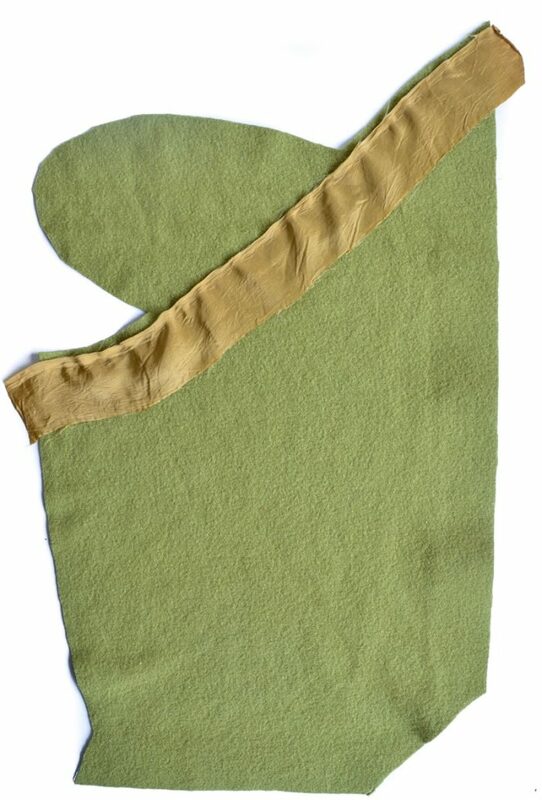 The Sapporo Pattern was a relatively easy sew, as long as I looked at the step I was at, not jumping ahead! I hit a problem when sewing the lining pieces together but this was easily resolved by referring back to the pattern pieces. I have pattern hacked a little, lengthening the sleeves – I didn’t fancy a super warm coat and cold wrists! Using a quilters ruler to add 4 inch dots along the cuff length as I traced the pattern, when it came to sewing up I narrowed the cuff. 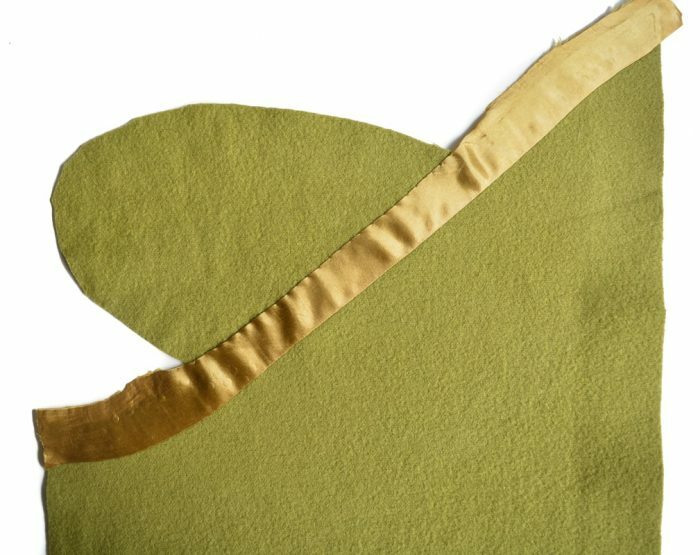 The front of the dress is made from two panels – this gives me the perfect opportunity to add in some of the beautiful ribbon edging the original blanket. I placed the ribbon parallel to the top edge of the bottom panel piece, tacking in place then stitching. Then I pressed and held with bondaweb. The piece of ribbon within the pocket was turned under and hand stitched. Then I joined the two front panels for the coat. The cuffs are naturally the second place to emphasize with the beautiful ribbon. Stitched in place on the right side of the fabric folded over onto the wrong side and held in place with bondaweb. When adding the lining I folded over the cuff raw edge of the lining and handstitched to the ribbon. I love how the ribbon highlights the shape of the front panels. To overcome the overwhelm I decided to spend half an hour a day on making the Sapporo Coat. This proved extremely helpful, virtually every day I felt intimidated but it was so worth it! My lining fit is not perfect, but for my first coat making experience I am happy. 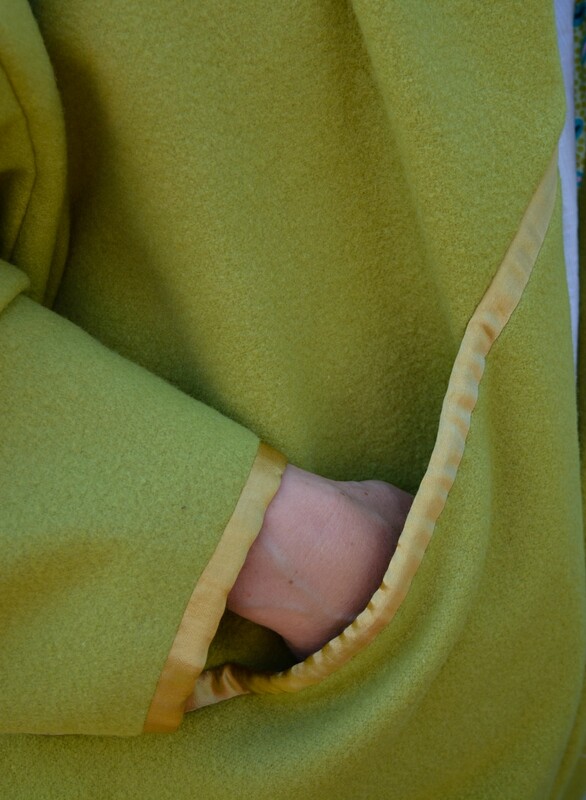 If you have not made a coat before I recommend the Sapporo Coat pattern. I have used the remaining wool to make a custom bag. 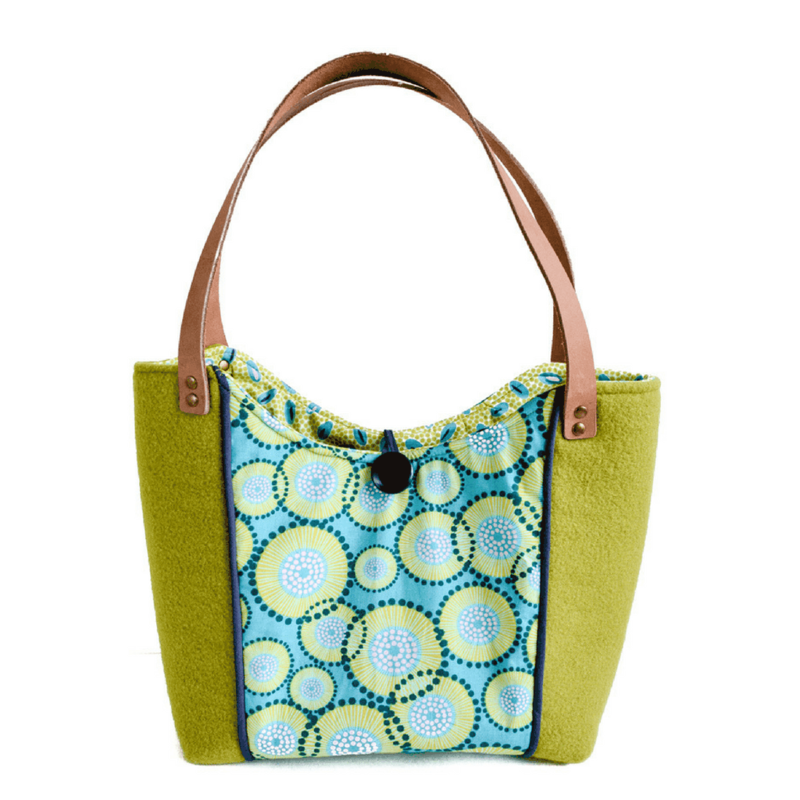 Check out the Spring Blooms Tote Bag tutorial. "How to paint over a gold mirror frame with Fusion Mineral paint"
"How to update your mid century furniture with fusion mineral paint"
I live your choice In the blanket, pattern and also the lining. I’ve been sewing since the 9th grade (58 years old now) however I wish my sewing skills were more advanced than they ate. I’ve had to pack my sewing room up because my daughter and two children moved in with my husband and I. I was finally able to have a room dedicated to sewing for just a few months before they moved in. Anyway,hen they move out I plan putting my room back together so I can learn those advanced techniques. Thanks for showing the tutorial! 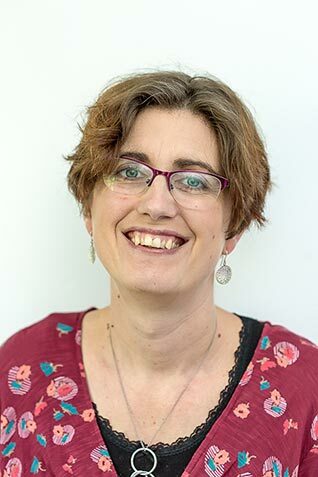 Hi Tammy, I can relate to loosing a sewing room – we loved with my father-in-law for four months, the four of us in one room. His home has one small table, finding oppprtunities to sew was difficult. All the best for your daughter and the children. Thanks so much Karen, I am so pleased I went for it. Great job – your coat is beautiful! Thank you Denise – admitting to failures/things not going right is important to me, I’m glad you found that helpful. Your coat turned out beautiful. I live in Florida so we don’t see many wool blankets in the op shops or have a need for wool coats but I would love to try my hand at making one! Thanks for sharing. I love your coat and the story of where it came from! What a good idea! You turned it into something unique and practical. The lining is a fabulous match for the coat. I’m glad you didn’t stop and finished it up! It looks wonderful. I came across this article while looking for ideas to use up bits from a blanket that I had made into a Cape coat for my 21yo daughter. Funning thing is that this pattern is next on my pile to make! I’m attempting it first with cheap light cotton for a summer/spring jacket but never thought to use a wool blanket- maybe next winter! I’m from New Zealand where that pattern is designed! So cool to see the internationally! Thanks for sharing you coat!